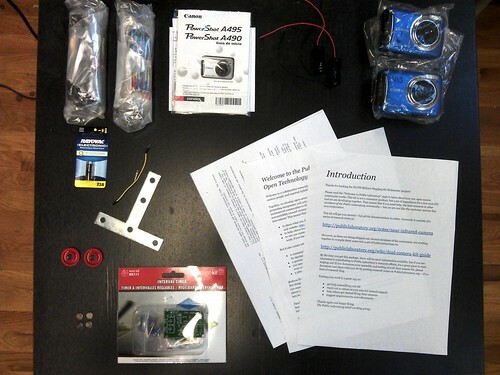 This page will host instructions on assembling and using the infrared/visible dual camera kit as distributed through the Balloon Mapping Kit Kickstarter project. This page is under construction and will not be complete until mappers report their early experiences with the equipment. Please get in touch on the mailing list if you want to contribute your knowledge here. Use the camera strap as a safety landyard. Protective enclosure: Build a case from a 1 gallon Tropicana juice jug, a variation on the PET-bottle rig. Someone should post a quick video runthrough of setting the cameras up "in the field", turning them on and closing the bottle enclosure. It could be simulated indoors on a hanging string? Do a test flight and post your results to share with others and help troubleshoot! The most powerful way to process VIS/NIR pairs is with Ned Horning's Photomonitoring plugin for Fiji. Watch the video screencast at the top of MapKnitter.org for an intro to stitching your images together into a map. Attached is the "introduction" document which shipped with each kit (also editable in Google Docs). For help, please contact the mailing list -- either register on Public Laboratory or email publiclaboratory@googlegroups.com.